At Australian Feral Management we shoot, tranquillize and net live animals and we have developed specialized equipment for the removal of stricken and dead deer. Six species of deer are established in the wild in Australia, having been introduced during the world-wide movement to ‘share the world’s most beautiful and useful things’ as was the objective of the acclimatisation societies which were active in the latter half of the 19th. Century. Of the many species which the acclimatisation societies and private individuals introduced, only the chital (Axis axis), fallow deer (Dama dama), hog deer (Axis porcinus), red deer (Cervus elaphus), rusa deer(Cervus timorensis) and sambar deer (Cervus unicolor) remain. 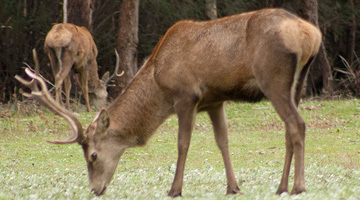 The rusa deer believed to number in the thousands in the Royal National Park south of Sydney are causing concern to neighbouring suburbs as the deer venture to feed in back yards and gardens. Many are injured and killed by motor vehicles, which also sustain considerable damage from the impact. Dead deer on highways are a traffic hazard as motorists try to avoid the carcass. Dead deer removal from public lands is essential to avoid a public health issues. Deer panic in suburban areas when disturbed and seek shelter in the most unusual places.